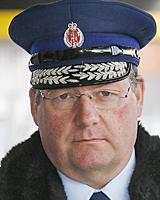 NZ Police Commissioner Howard Broad should be sacked! After his taser trial report came out at the start of the year – just after the $8m bungled police hounding of Tuhoe activists in the terrorist Operation Eight – Broad did not want to ask for more lethal weapons, so he sat on the report. 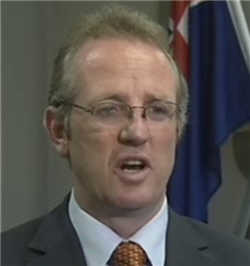 Seeing an opportunity, Broad waited until the start of the scheduled 2008 election campaign to release the report, knowing that no political party wants to look soft on law and order in an election. And Broad tops it off with his sham ‘consultation’ with MPs, that lasts about 12 hours and just involves Broad listening to one parliamentary debate, without even waiting for MPs to give him written submissions. Broad even says “I was not asking for the minister’s approval, I wasn’t asking for a serious piece of advice, …” How shameful is that? And who said an unelected, unaccountable police commissioner should decide what weapons he and his chums get to use on the public? ‘By convention…’ please!!!! This deranged ‘convention’ must be changed immediately. The new Policing Bill before parliament should include specific limitation on police, so they can only use weapons specified by full parliamentary approval in law. No more back-door sham consults by a police, who want the power of kings. Putting the decision to Parliament was a further erosion of the convention of the commissioner’s operational independence of Parliament. Mr O’Connor said it set a dangerous precedent if Parliament changed its mind on the Taser in the future, or if other controversial decisions would now be expected to be put to MPs. What more can you say – ‘Rant’ O’Connor wants police to be above the law, able to choose their own weapons without oversight or approval by elected representatives of the people he wishes to inflict those weapons on. A monster. A no-brainer indeed! Any MP who lets cops have tasers shows no brains, any MP who lets cops decide what weapons they get has no brains, and anyone who tries to portray police as at risk (they’re not – they are well down the ACC list of hazardous professions) has no brains. It is the NZ public who are at risk from increasingly well-armed and thuggish police. Not surprising, given their union head and commissioner, is it? Update: The Mental Health Foundation has called on the police to not introduce tasers without first properly consulting them, as mental health sufferers are far more likely to suffer from police tasering. Will Howard Broad run another 12 hour ‘consultation’? Update 2: Oh my stars! It just gets worse. The NZ police ‘study’ they used to justify introducing tasers includes the gem that 39% of cops can’t think of any downside to tasers. Hint to mindless cops – 300 deaths in the USA from taser use! The report said 39 per cent of officers surveyed could identify no risks or disadvantages to having a Taser available to police officers. Some thought that the Taser posed no more risk than other tactical options. The potential risks identified were that subjects may gain control of the Taser and use it to incapacitate officers, misuse of the device, and that some officers may become over reliant on Tasers, electing to use them when firearms should be used. And the dangers the rest of these cops identified were all about dangers to them – nothing about dangers to the public or ‘suspects’ – the people these electro-shock weapons are aimed at. Frightening. Not one cop identified any risk to the people they use 50,000 volt guns on. Update 3: Stunning!!! Police commissioner Howard Broad doesn’t want to get tasered, even though he is happy to inflict this on every police officer who trains to use the taser, and he is happy for tasers to electro-shock any member of the public; old, young, mentally ill, unfit, heart conditions… Can anyone spell dangerous hypocrite? If Howard Broad won’t front to get tasered live on 6pm TV news, then MPs should immediately ban tasers. Only fair. The shameful saga of Labour approving NZ Police use of electro-shock weapons – tasers – has continued, with police minister Annette King telling parliament that police commissioner Howard Broad will decide soon, after he has heard what MPs think. King makes clear though, that what MPs say will not decide Broad, but that Broad has some kind of power over parliament to decide what weapons the police can use. Truly disgraceful! It is time for clear laws to be put in place that limit the weapons police can use to be only those approved by parliament, after public consultation. I for one do not want the least intelligent, most thuggish sector of society – the police – to have 50,000 volt electro-shock guns. And no, I am not reassured by Annette King’s mindless blather about police being audited by having short video clips recorded every time a taser is fired (camera built into taser). Police have shown themselves willing to ‘lose’ or ‘edit’ footage in the past to justify their actions. And even if unedited video is available of tasering incidents, we have only just seen several cops get off scot-free after being caught on unedited CCTV video beating and pepper spraying repeatedly a mentally ill prisoner locked in a cell in the Bay of Plenty. And the judge blocked public release of the video as it would show the truth. Hardly reason to have confidence in the police getting tasers. I’m with the UN – tasers are torture!! Ban everyone from having them – especially the cops! Good to see the Mounties are showing NZ how safe we will be if the police get the tasers they so desperately want. WINNIPEG, Manitoba – Winnipeg police say a teenager has died after being shot with a taser gun while he was brandishing a knife at officers. I’m sure some will say the kid had a knife, yadda, yadda. That is why police are given stab-proof vests, riot shields, pepper spray, long batons and generally have the ability to surround offenders with large numbers. Police could even investigate using deer net guns (shoots big net over suspect, which tangles them). But tasers, safe? Yeh, right! News just in (4pm news, National Radio, 5 Feb 08) reports another death in South Auckland – this time at Police hands. A 40-year old Polynesian man in Mangere was being spoken to by Police for an alleged assault, when capsicum spray was used to subdue him (along with a baton blow to his arm). NZ needs a genuinely independent police complaints body – one which has no police involved in investigations or the writing of reports. Let the Civil Liberties Union pick a panel to run it. it seems the police’s Diplomatic Protection Squad (DPS) couldn’t even spot a few random taggers, or burglars, or Exclusive Brethren, … when they play whoopy at the PM’s house, or Parliament. In their defence, police assigned to protect the PM (by speeding to rugby matches?) could hardly be expected to watch her residence or place of work, could they? Nah, too much to expect. The police officer who shot dead Stephen Bellingham in Christchurch has been cleared of any criminal charges by an internal police investigation. Bellingham allegedly attacked the officer with a claw hammer, though there are conflicting eye witness accounts as to whether Bellingham actually had a hammer at the point he advanced on the cop. It is not the first time this cop has faced allegations of violence. The ‘Independent’ Police Complaints Authority (aka the police congratulatory authority – it is made up of a few retired judges, but their investigations of police are normally done by … police) investigation is ongoing. The key problem here is these reviews rarely look at police actions leading up to the shootings other than to establish the locations of the people involved. There needs to be systemic understanding of the alternatives police have available to them (use of numbers, riot gear, pepper spray, police dogs, etc). This is not to downplay the difficulties police frequently face – just to highlight the growing police compliance culture; ‘obey or die’ (or get tasered, or …). We need a royal commission of enquiry into police use of alternative methods of resolving violent incidents, especially focussed on how police get themselves in situations where they needlessly confront offenders in a manner that endangers themselves, justifying use of lethal force. That way we will avoid more ‘cop kills civilian’ incidents like the Bellingham and Steven Wallace shootings (2 cops left 1 cop at the scene of a drunk window-smashing Wallace in Waitara to get guns, returned and shot and killed Wallace after he advanced on them) – see related “Taser fun for everyone” post. Stunning – PC Plod has done it again! Just weeks after Canadian police repeatedly taser a Polish migrant to his death at Vancouver airport, US police taser a man just out of his spa pool. Police forced their way into Donnell Williams’ home in Wichita as he was just getting out of his tub, with a towel around his waist. They say they told him to show them his hands and he didn’t. Williams says he wasn’t wearing his hearing aid and couldn’t hear. “I kept going to my ear yelling that I was scared. I can’t hear! I can’t hear,” he said. Apparently, the officers didn’t hear him because when he didn’t comply, they Tasered him. The police were responding to a call about a shooting, a call that turned out to be a false alarm. Oh, and the Wichita man was telling police he couldn’t hear them … because he did not have his hearing aid in. And police could hardly claim he was concealing a weapon. Despite this, the cops decided to taser the (presumably wet) man. It seems police truly view tasers as a compliance weapon – you will comply with all police commands immediately or be tasered (maybe to death). And NZ police want to introduce tasers here!!! Sadly, when cops have the option of weapons, they all too frequently go for them as a first response, not a last ditch method. Witness the 2000 killing of drunk golf-club wielding Waitara man Steven Wallace; 2 male cops left their female colleague alone with Wallace for 10 minutes while they went to get Glock pistols at the local cop-shop, before returning and shooting Wallace dead. While police claim Wallace advanced on them, this may have been triggered by the cops first shooting over Wallaces’ head (the police summary linked to above paints the police actions in a better light than the details of the police inquiry report). It also ignores the fact that police outnumbered a drunk man by 3 to 1. Riot shields would have stopped Wallace seriously harming the cops while they subdued him. So having tasers available would not have stopped police killing Wallace – the 2 officers went past riot gear to get guns; they would also probably have ignored tasers. Verdict – giving tasers to police will increase the numbers of members of the public killed by police, not decrease them.